It’s happening again: another contemporary hitmaker is involved in a lawsuit with the estate of a well-loved musician over alleged unauthorized use of elements of the latter’s past work. In this case, the issue is Robin Thicke’s 2013 hit “Blurred Lines” and the Gaye family’s claim that the song illegally appropriates elements from Marvin Gaye’s #1 hit “Got to Give it Up,” released in 1977. After more than a year of legal wrangling, it now appears that the dispute may be one of the rare infringement cases that makes it to trial. 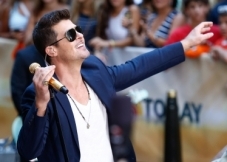 But there’s a surprising wrinkle: in the course of litigating this dispute, Thicke may have let slip one of the music business’s more troubling open secrets.